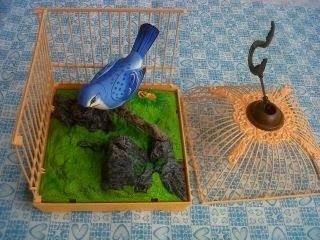 This is a simple circuit that I use to replace my mom bird toys which broken by water during the rain. It work on clapping detection and then the bird singing and moving on a period of time. The bird sound circuit replaced by other singing circuit that I took from unused bubble machine toy. The sensor pick a sudden change of air vibration which come from a clap or knocking by a piezo device. First transistor (Q6) amplifies the signal and feed to Second transistor (Q3) to drive low on the output when an air vibration is detected. The output will goes low for a short time. To extend the time, the output feed to input of a monostable multivibrator. When the input pulled low, then the 4th transistor (Q5) become active. 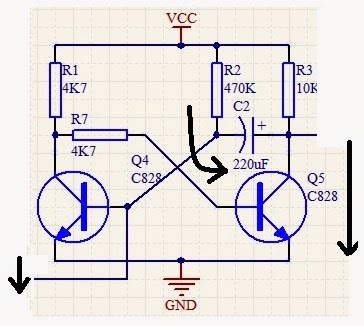 During the time the Capacitor (C2) will charge reversed by (R2) until the voltage across Base of 4th Transistor above the VBE, and then then the Q4 will active and also turned off the Q5. You may search the google about the time constant of the RC charge, in this circuit the times Q5 goes low is about 5 second, which give enough time for the bird to sing and move. The output then feed to an PNP transistor (Q2) which act like a positive switch to the output which connected to singing circuit and a motor to move the bird. 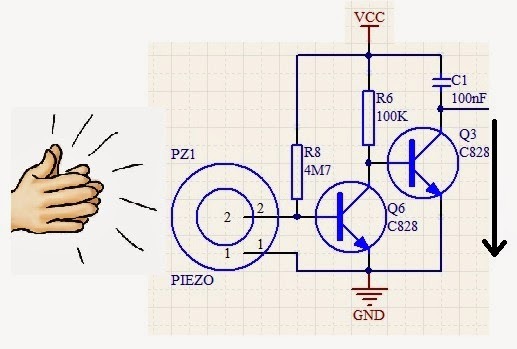 The problem is when the bird sing and moving, the piezo will pick up many vibration, so the monostable multivibrator will also feed by a low input many times. And the bird will sing and moving continuously. To avoid that, an addition NPN transistor over the clap sensor supply was placed, it work by cut off the power from sensor circuit to make it inactive when the output of multivibrator goes low. And the result was astonishing, just clap on and the bird will sing and moving for 5 Second, and again my mom's was happy. The whole thing was not merely high tech, it's just pure fun thing. But this remind me that the Electronics was fun, and Electronics should make everyone happy. yes, Electronics for fun!